February is my favorite month all year. Why? Because here in Florida it’s strawberry season! Our local strawberries are the best anywhere. My family and I go every year to a local strawberry u-pick farm and have the best time. There’s nothing quite like eating the berries fresh from the field. We also head over to our state’s Strawberry Festival. It’s a huge week long festival with tons of entertainment and of course lots and lots of strawberries! The grocery stores are also loaded with fresh strawberries that are super cheap. We end up eating strawberries everyday, and we never get tired of them because they are so amazing! You can incorporate fresh florida strawberries in lots of different sweet and savory recipes. One of our favorite savory recipes is strawberry salsa. It’s a wonderful snack. Strawberries are so good in sweat treats though, wouldn’t you agree? Especially when you pair strawberries with lightly sweetened fresh whipped cream. It’s a match made in heaven. For my strawberry desserts, I live to keep them light and not overly complicated. 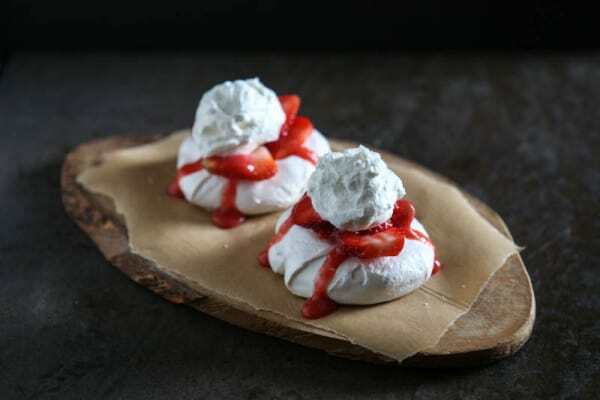 That’s why these Strawberry Vanilla Meringues and Cream desserts are one of my family’s favorites. The crisp meringue paired with the ripe berries and whipped cream are so perfect! 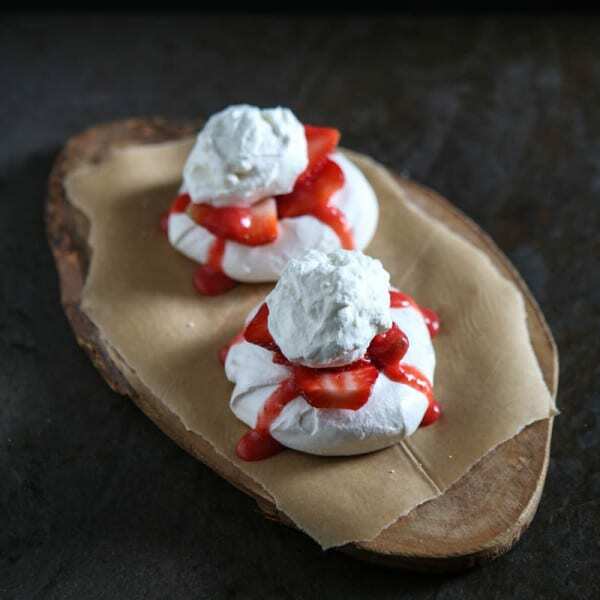 To make this dessert, I start by making the meringues. You just whip the egg whites and cream of tartar together until soft peaks form, and then gradually add in the sugar. Lastly, I add in bourbon nail. That’s the secret ingredient that makes these meringues so delicious! Then I scoop the mixture onto a parchment paper lined cookie sheet and bake at 225° for 45 – 55 minutes. As they cook, I slice up some fresh berries, make the whipped cream and the fresh strawberry sauce. For the sauce, I just toss a few ripe berries in the food processor with a touch of sugar and give them a whirl. When they’ve purred into a smooth sauce, they’re all done! You can strain you’re sauce, or just leave the seeds in it like I’ve don here. 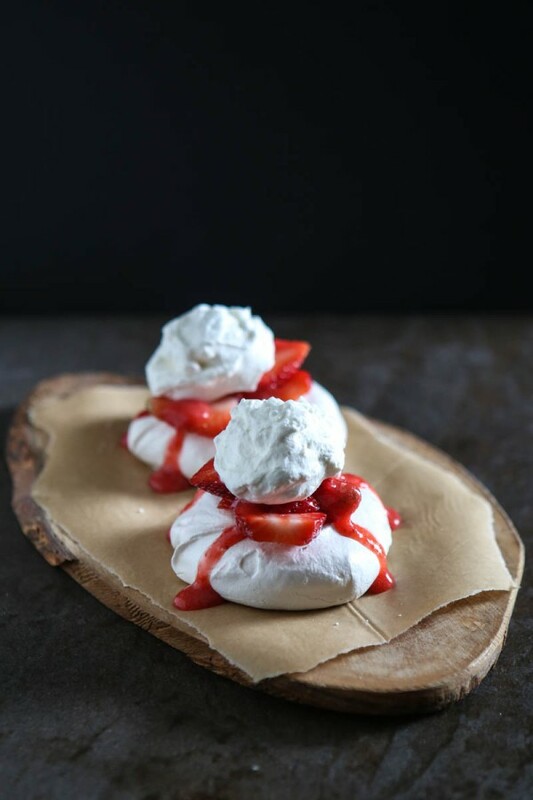 When the meringues are done and have cooled, I place them on a plate and top with fresh berries, the whipped cream and that easy strawberry sauce. It’s so simple, delicious and such a great way to utilize fresh Florida strawberries! You can head over to the Fresh from Florida and view some amazing recipes that utilize fresh seasonal Florida produce and seafood. Be sure to check back often because they update the site with seasonal recipes. Or, next time you are dining out or shopping for groceries, look for the Fresh From Florida logo to make sure that your food selections are fresh, healthy and support your local community. Be sure to connect with Fresh from Florida on Facebook and Fresh from Florida on Twitter too! Heat oven to 225°. In a large bowl, beat egg whites and cream of tartar with an electric mixer until soft peaks form. Add sugar gradually, a teaspoon at a time while continuing to beat egg whites. Continue adding and mixing egg whites until stiff glossy peaks form and all sugar is dissolved. Add vanilla extract to egg mixture and mix well. On a parchment lined cookie sheet, divide egg mixture evenly into 6 meringues. Press spoon in center of meringues to make a bowl shape. (This makes room for the strawberries that you will add after baking.) Place in oven and bake at 225° for 45 - 55 minutes, or until set and lightly browned. Add heavy cream to a large bowl. Beat with an electric mixer until soft peaks form. Add sugar and vanilla and beat again until sugar and vanilla are well incorporated. For the strawberry sauce, add strawberries and sugar to a food processor. Turn on high until berries and sugar form a sauce. If desired, strain sauce to remove seeds. 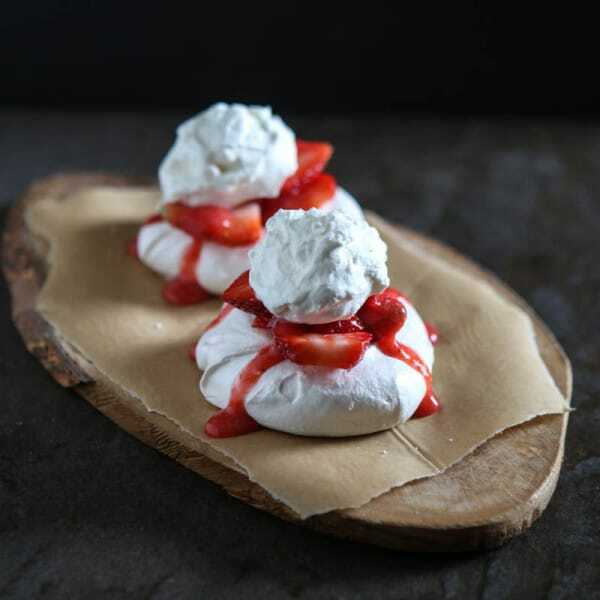 Place meringues on plate and top with fresh strawberries and cream. Drizzle with strawberry sauce. Serve and enjoy! Ahhhh strawberry season is the greatest! Wish i lived in Florida! Lol these look like the best! These are like baby Pavlovas. I love them, and love strawberry season! These are gorgeous! So elegant and the perfect sweet indulgences for a special occasion! We love strawberry season in FL. The kids and I haven’t been for a long time to pick strawberries. This year we will have to go. Such pretty little meringues, Angie! These are gorgeous — especially that strawberry sauce. I love how red it is. That’s always the sign — to me — of super fresh, locally grown strawberries. You just can’t duplicate that with ones that have been carted across the country. I’m jealous that you’re already getting strawberry season! Our strawberry season doesn’t start until like June! I’m so jealous!! Those Vanilla Meringues are perfect! Oh boy. Here comes trouble! I can see myself fall head over heals in love with these adorable meringues!! I love how you dressed them up and the photos are simply gorgeous! Strawberries are about $8 to $10 for a small bunch here right now. Yet I love them enough to do it. So jealous you’re enjoying strawberry season now. I wish it was year round. These are stunningly gorgeous. I love meringue with strawberries. Plus the vanilla just brings out the flavour of the berries. Just loving this one. 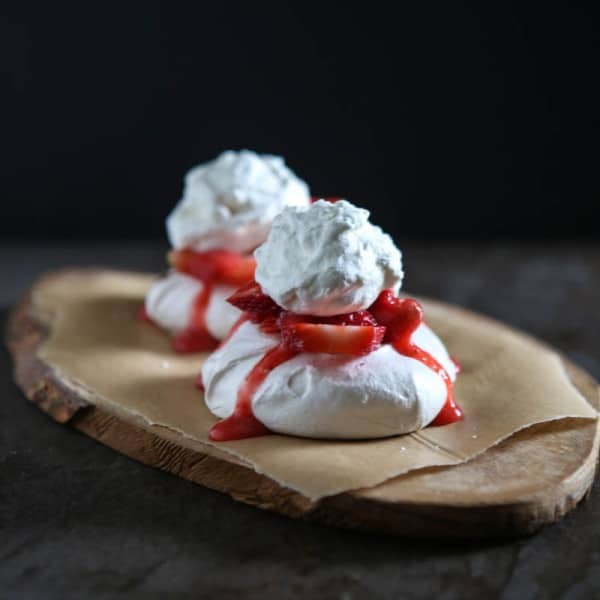 Those strawberry meringues look gorgeous. I wish I saw this recipe before V-Day. My wife would have loved them. Then again, I can always make these for her anytime. This is one beautiful and totally delicious looking desserts. I love when Florida strawberries start popping up. It reminds me that winter is almost over!!! !